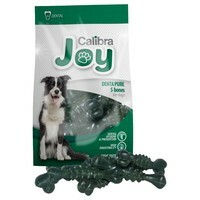 Calibra Joy Denta Pure Bones are tasty and easily digestible treats for your dog that will help to improve and maintain good dental hygiene. Ideal as a daily snack or training reward, the treats have been made with a unique texture and shape that will gently clean your dog’s teeth and gums as they chew, whilst the mint flavouring will help to leave their breath smelling clean and fresh. Please Note: The weight of the packs are the same, but the size of the bone varies depending on the 5 or 10 pack.